I think the main plus of being able to delay is that it gives players an option other than passing their turn if they have nothing that seems advantageous to do. They can choose to wait and see if something develops that they want to respond to. I think that problem is part of the reason we have seen at-will powers become ubiquitous. When combat is mostly (time-wise) what the game is about, not participating in rounds of combat is boring. I have also seen though that in 3e that initiative and speed are often incredibly important – characters tend to put out so much damage that combat is often merely a question of will the monsters get to attack at all. The first time I ever played third edition was a world’s largest dungeon campaign which I eventually quit because my dwarven fighter rarely touched combat because the other characters were so much faster. I think this experience has shaped my whole view of modern D&D. That’s a good point, but couldn’t it be more easily handled with just a surprise system? Then, if you want to get the drop on enemies so that you can drop your nukes, you focus on achieving a surprise round. Yes. A d20 roll is a staggeringly bad way to implement this in fact. Oddly, at least in Pathfinder, there are not actually any surprise rules. It is an area that relies on GM arbitration! I am paraphrasing but I believe the rulebook basically states: “there is a surprise round if one group is not aware of the other.” How can you possibly trust someone to decide that? Where are the rules? Is it possible that someone could make a common sense decision? Oh wait, we could just roll an opposed pereption-stealth thingy. So close . . . back to just rolling d20s. Yeah, I was just reading the Pathfinder guidelines for surprise actually, and thinking: wow, this is awfully handwavey for a game known for tight tactical mechanical combat rules. Just to throw in a home brew idea, not really changing the structure of how initiative works, just making it a bit fairer (in my opinion) for all. Add Dex and Int together, take an average, and use that as the base stat to work out modifier. It’s something Savage worlds does, and makes a lot of sense in that stupid people with high dex might be able to move quickly, but could take a half second to think about what they’re doing longer than someone who knew what’s what. The 3e system wasn’t cumbersome at all. You didn’t really need to remember the numbers, all you needed to know was the initial order. The easiest way to handle it is to use cards for each player and order the cards at the beginning of combat. When a player takes his action, you move his card to the back and do the next. One common use of the delay action was disrupting wizards and waiting until one character moved out of the way. You can’t really compare the d20 way to AD&D because AD&D requires players to announce their actions at the beginning of the round. d20 actions are all self contained so it makes less difference the order they go in (particularly the order of the players). That’s why d20 doesn’t have modifiers for weapon used or spells being case since you decide which ones to use after it is your turn. Maybe it’s just the way my head works, but I find d20 individual initiative to be quite cumbersome (my experience is from 4E, but the system is almost identical). Using cards seems like it might be even more work to me, because I would need to write down all the numbers first in order to sort them; otherwise, I would forget which number applied to which character. But once you have established the order of the cards, the actual numbers rolled aren’t important, there’s no need to remember them. In fact, all you really need to do is group the players into those that beat the monsters and those that didn’t. Because players can delay around each other, the actual numbers the players get don’t really mean anything. So, determine which characters beat the monster. They can move in whatever order they wish (resolving conflicts with the initiative die roll), then move the monsters, then all those that didn’t beat the monsters can go. Once you get used to it, it’s a pretty flexible system. However, I still prefer group initiative ala B/X. Yes, initiative cards are the best way to handle 3e style if you’re playing a game like that. Also, I find it best to not to try tracking anything else on the initiative cards. What you can do, however, is stick additional cards in the stack to track effects of limited duration. Write the number of rounds on it, and when that card comes up, put a tick-mark on it. Flashing Blades goes by weapon length, with Dexterity and character height as the tie breakers. HR4 A Mighty Fortress has some interesting duelling rules that require winning initiative to be able to attack at all when engaged against opponents using a particular style. Of course, most of these are for one on one fights, and would probably be a bit cumbersome in a big multiparty D&D combat. I’m not all that familiar with Flashing Blades. Does it distinguish at all between duels and other fighting? Some of Chaosium’s solutions could be ported to D&D no problem. BRP (in its essential “Big Gold Book” rules and in iterations like Call of Cthulhu) uses Dexterity order for combat, much like Holmes Basic. Like you, though, I’m happy with Moldvay’s d6 every round. With only three players in my games, I let them roll initiative individually (and I roll once for each monster type) so Dexterity does have an effect. To keep it simple, though, I rule that retainers (and war dogs) go on their master’s initiative. 1d10 versus 1d10 for us, no dexterity adjustments usually, and weapon length is the determinant in the first round. I’ve always liked the idea of weapon length making a difference, but whenever I have thought much about it, I always end up adding too much complexity. Making it only important in the first round is a nice compromise. The one thing that has always stuck out at me is that in real combat, spears, pikes, and polearms were often used to keep enemies at a distance, and they worked entirely 100% up until the point where they didn’t. For example, if a dagger wielder gets past the points of a spear line, those spear wielders are pretty much dagger meat. For me, I consider variable damage by weapon to mainly represent weapon length. I’ve long considered letting a character with a longer weapon keep an opponent at bay with it instead of attacking. Then have some kind of contest roll for the attacker to try to get “inside”. I don’t agree with the spear user being at a serious disadvantage once a dagger user gets “inside”, though. Spears have secondary attack modes, and there are other factors. More like they’re now on a equal level. Yeah, I like this “keeping at bay” idea; I may run with it a bit more in another post. Regarding spears, you might be right regarding a shorter spear, but longer spears like pikes start to get pretty useless once enemies are closer to you than the pike head (pretty much all you can do is push the haft between your hands at the opponent with whatever degree of force you can muster; more of a parry really, than a real attack). I was just reading the HR4 A Mighty Fortress historical supplement, and that book talks about how two-handed swords were sometimes used by melee fighters to chop through pike hafts so that cavalry and other soldiers could get up and close. Pikes and spears are, in practice, totally different things. I think a lone pikeman would have a difficult time keeping an opponent at bay. The unwieldiness begins to matter more than the mechanical and reach advantages when you get to those lengths. Pikes and the kind of two-handed swords that were designed to cut through them really, IMHO, have no place in a skirmish game. Those are highly specialized weapons that should probably be penalized outside of their intended use. 1 d 6. Any plus to missile fire for dex also applied to reaction time. “Anybody over a 6? Any sixes? Any fives?” Etc. Very similar to AD&D, but quicker to count since it was a d6. Of course, fewer potential modifiers too. I see where you’re coming from with the static (after initial generation) initiative order issue. I’ve played both 2E (with weapons speed and casting time) and 3E, and I also agree that taking weapons speed, etc. into account has a certain feeling of good modeling. Although, in my memory it was easy to forget to include those details when rolling for initiative. I’m not sure why you’re criticizing “roll high”, or the use of a d20 instead of d10. They don’t seem to have much to do with your other issues. And as the devil’s advocate, I’d argue that, on one hand, “higher is better” is more intuitively obvious at least to my mind, and on the other hand, rolling a d20 is arguably less likely to produce ties than a d10. Besides if you want it’s still possible to apply turn-by-turn initiative and speed factors with a d20/roll high system. Not sure why that would be a problem. In this case, d10 is better because it is feasible to count to 10 every round, whereas when counting to 20 most of the numbers will not correspond to any actions. It seems like using a d20 just because that is the primary resolution mechanic. Also, “lower is better” (in this case) allows you to count from 1 (you have an absolute best). With d20 “higher is better,” you don’t know from what number you should start counting (because bonuses could be theoretically unlimited). You could work it using a binary search (any above 50? no? what about 25? ), but that still seems a bit awkward, no? One could also cap initiative at 20, I suppose, or some arbitrary higher number. The AD&D style was totally unintuitive to me for a long time. I didn’t grok it from the main AD&D books; there was some blog post that finally explained segments to me. I’m pretty sure we never used speed factors back in my 2E days. In fact, I have no memory about how we did initiative actually. The maximum achievable initiative score we could figure out how to generate for a ‘reasonable’ PC back when we were playing 20th-level 3.0 was 35; +10 from Dex (18 +2 elf or halfling +6 enhancement +4 from wishes for +Dex -> 30 Dex -> +10 modifier), +4 from improved initiative, +1 from carrying an Eager dagger (weapon enchantment from Arms and Equipment Guide), and a natural 20. So there is a practical sub-epic cap… granted, I bet a bunch of the 3.5 material came along with more bonuses. Group initiative, one player and the DM roll a d6. Players win ties. Players like winning ties. DMs like giving monsters a flat 41.7% chance to act first, rather than just getting immediately killed by quick characters with their magical killamajigs. New individual initiative every round with the default Pathfinder d20 + Boni. It works beause of computerized automatic rolls. Just one click and the next round starts. We played like this for years without computer, and it was indeed “a bit of a hassle”… but more interesting thean the same order every round. In my experience, group initiative gets the PCs working together more than individual initiative. Probably my biggest issue with 3e initiative, however, is that the die roll is so big of a factor compared to the character’s modifiers. An 18 dex and improved initiative is…what?…+8. So, best case, your modifier is only 40% of the die’s range. Typically it’s much less. Rolling once per combat only compounds that issue. I’d prefer for it to be straight random than to have a modifier that doesn’t feel like it makes it any less random. By the way, this 1d10 individual initiative seems to be… Second Edition? At the very least, it is in 2E, as I see the rules on page 95 of the 2E PHB. I was just trying to find references to it in my AD&D First Edition books, and what I found there was actually d6 party initiative. 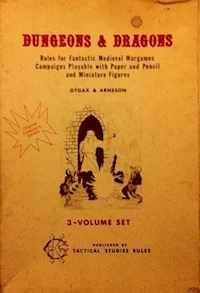 However, it could also be there somewhere else too; the main AD&D books are not exactly paragons of organization. Gary still did one roll per side, though. Spells either ignored initiative and went off on the segment equal to their casting time or their casting time was added to the side’s segment. (I recall him writing both in different messages.) Weapon speeds were only used to break ties. My interpretation of D&D 3.5 initiative rules was as follows: Assuming players can delay anyway, the only thing that matters is who goes before the monsters go in the first round. So: the surprising side gets a standard action (in any order), everybody rolls initiative, DM says what the monsters’ initiative is, whoever rolled higher gets to go (in any order), then monsters go, players go (in any order), monsters go, etc. It was very simple, as far as I can tell it was 100% equivalent to the D&D 3.5 rules but is about 10 times simpler than what they write in the rule book.